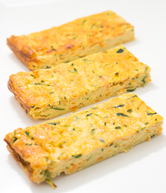 Include veggie slices (e.g. tomato, red capsicum, cucumber, steamed carrot) and dips. For flavour and variety add fruit, cheese and lean cold meats. You can also add a selection of veggies to your regular fruit platter (e.g. strips of capsicum, cucumber, grated carrot). Fill celery sticks with cream cheese or peanut butter (if allowed) and dot with currants or sultanas. 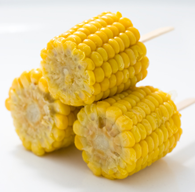 Steam corn on the cob or cook frozen corn cobbettes. Top wholemeal crispbread, corn thins or rice crackers with cottage or cream cheese and your choice of avocado, lettuce, tomato and cucumber. Serve small portions in cups on a cold day. For fun, try Pumped up pumpkin or Shrek soup (green pea and ham). Toss chopped fresh vegetables to make a garden salad, or combine roasted veggies to make a warm roast veggie salad (add some grilled chicken breast for variety). Mix shredded carrots with raisins and natural yoghurt and serve in iceberg lettuce leaves. Click here for the recipe. Make sweet crunchy chips by slicing carrot, zucchini, potato and sweet potato, spraying with olive oil and baking until golden. Mix grated vegetables (e.g. zucchini) with chopped onion, cheese, flour and eggs and bake in a moderate oven until golden brown. Encourage kids to fill pita pockets with their choice of chopped vegetables and dips. Try pumpkin and zucchini, carrot and sultana, cheese and corn, pumpkin and date, sweet potato, zucchini and poppy seed. Serve warm baked beans topped with grated cheese in a cup or pour the beans over wholegrain toast. 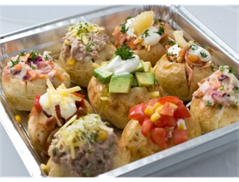 Cook small potatoes, cut the tops off and scoop out some potato. Fill with creamed corn, salsa, coleslaw or baked beans. Offer a bowl of colourful veggies with main meals and encourage kids to help themselves at the table.